Thunder Bay, ON- Saving on energy can pay big dividends and Thunder Bay Regional Health Sciences Centre (TBRHSC) is a perfect example. Today, TBRHSC received the largest rebate in the history of Thunder Bay Hydro, and one of the most prevalent in Ontario, in the amount of $597,554.62. "Thunder Bay Hydro is working to develop sustainable and collaborative relationships to help local organizations save on energy," says President of Thunder Bay Hydro, Robert Mace. “We are thrilled to have secured Thunder Bay Regional Health Sciences Centre to participate in the saveONenergy RETROFIT PROGRAM. I am not aware of any other local organization that has achieved a comparable level of energy efficiency." The saveONenergy RETROFIT PROGRAM delivered by Thunder Bay Hydro provides incentives for commercial operations to install newer, more energy efficient solutions. Working with Johnson Controls, TBRHSC completed the RETROFIT project in July 2013. The energy efficient upgrades involved a Heating, Ventilation and Air Conditioning (HVAC) systems retrofit. “This project has significantly improved electricity performance and is expected to save a total of 5,288,093 kWh annually, which represents 22% of TBRHSC’s annual energy consumption. This is enough energy to power as many as 550 homes in Thunder Bay,” continues Mace. “At Thunder Bay Hydro, we encourage all residents and businesses to follow the lead of Thunder Bay Regional Health Sciences Centre. Let us help you to save more through the saveONenergy programs.” Energy consumption in hospitals across Ontario continues to rise steadily, as specialist equipment greatly relies on electricity to operate. The incentive delivered by Thunder Bay Hydro through the saveONenergy RETROFIT PROGRAM will be reinvested into operations and improving patient care services at TBRHSC. 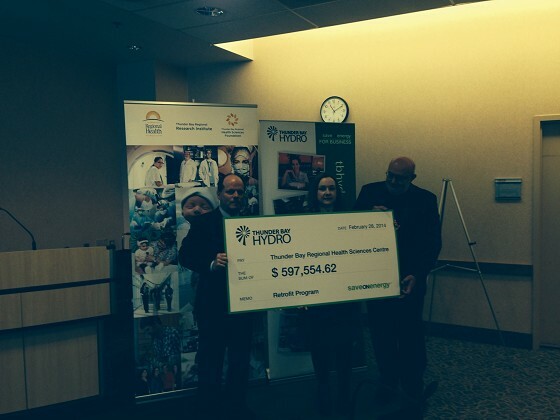 “This generous incentive from Thunder Bay Hydro enhances TBRHSC’s commitment to patients, families and our community. It enables a comprehensive infrastructure retrofit program that reduces costs and emissions that also allows us to focus more resources on direct patient care,” says Dr. Mark Henderson, Executive VP, Patient Services & Regional VP Cancer Care Ontario. “Funding from the Ontario Hospital Association (OHA) has also allowed TBRHSC to reduce utility costs as well as leverage rebates from utility providers such as Thunder Bay Hydro,” adds Henderson. Improvements to ventilation and control systems will also result in an improved environment for staff and patients. “Patients and families at TBRHSC will experience increased levels of comfort thanks to a consistent temperature throughout the facility,” says Keith Taylor, a Patient Family Advisor at TBRHSC.